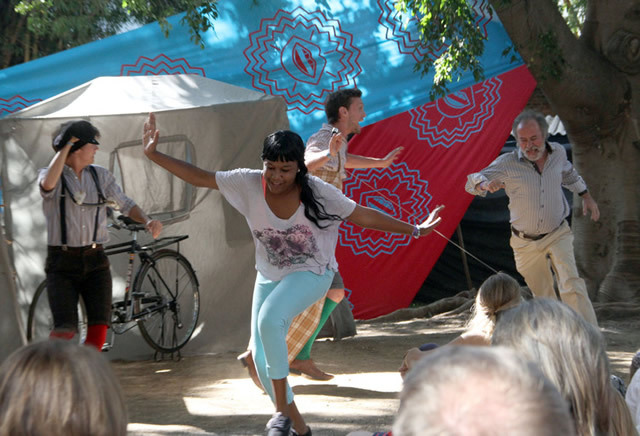 The HandleBards a bicycle-powered, 4-strong, all male troupe thrilled audiences at the recently ended Harare International Festival of the Arts with their intelligent comic act. They performed Shakespeare’s “The Comedy of Errors” and “Macbeth” on the third and last day of Hifa and they left the audience clamouring for more. The troupe carried on their four bicycles all the necessary set, props, costumes and camping equipment to perform Shakespeare’s anarchic farce of mistaken identity in “The Comedy of Errors” and the dark tale of ambition, magic and murder in “Macbeth”. The HandleBards do Shakespeare differently using bikes to power various surprises and contraptions on-stage, whilst playing all the parts in Drector James Farrell’s wild 1930s indie-folk frolic. The actors randomly picked members of the audience to incorporate into their act thus hyping up the interest and enjoyment. In an interview with The Herald Entertainment, they said they decided to make use of the audience in their acts because of their number and also to spice up the act. “We are only four and we try by all means to play all the parts in the play but there comes a time when we cannot do it anymore and that is when we invite part of the audience randomly to play some parts and we also discovered that it’s a funny experience and the audience loves it,” said Tom Dixon, the group’s manager who is also part of the cast. On why they perform Shakespearean plays only, they said the popularity that William Shakespeare has around the globe has enticed them to concentrate on his plays. “Every country we have visited, people are so familiar with Shakespeare and his plays so because we want to reach out to a diverse audience we decided to do his plays so everyone will enjoy it,” they said. The UK born troupe hailed Zimbabweans for their hospitality expressed the hope that they would return to the continent again. “Africa is the best place to be, we enjoyed every moment and we just pray we will be able to come back again, the people, environment even the stage is just different,” said Tom.